BOSTON, Mass. 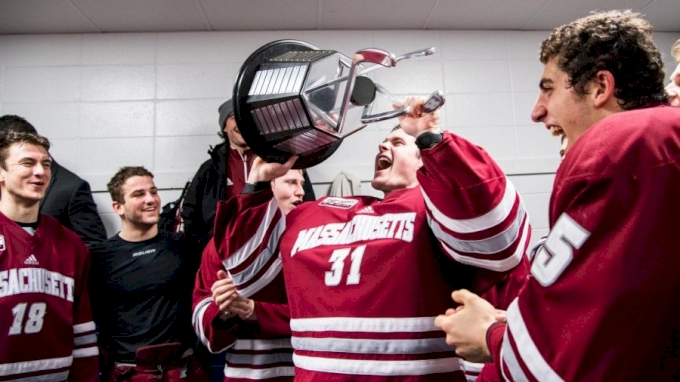 — Northeastern will defend its Beanpot title on the back of their freshman sensation Tyler Madden. The Vancouver Canucks prospect used his speed to get by the defenders and had Boston University goalkeeper Jake Ottinger in his sights. He fired off a shot that beat the junior netminder 51 seconds into OT to give the Huskies a 2-1 victory at the TD Garden Monday night. It was Madden’s ninth goal of the season. With 21 points, he ranks second on the team. The Huskies will take on Boston College in the final next Monday, while the Terriers will take on Harvard in the consolation game. “I have been coming to the Garden quite a while now for games and there were bright lights out there and I shine in those,” Madden said. He had another of his game-winning celebrations which he said he doesn’t preplan for. That confidence is nothing new for Northeastern coach Jim Madigan. There was no easy way to describe the feeling in the Terriers’ locker room. Northeastern’s Patrick Schultz got the scoring started as Liam Pecararo found him at the 3:14 mark of the first period. The Terriers (10-12-3 overall, 8-6-2 Hockey East) couldn’t capitalize on back-to-back power plays as Pecararo went to the book for hooking at the 3:56 mark while Biagio Lerario went off at the 5:47 mark. There was a game within the game as Joel Farabee, who was drafted in the first round by Philadelphia this past June, found beat Northeastern goalie Cayden Primeau with 21 seconds remaining in the open frame to tie the game. Cameron Crotty had the lone assist. Farabee and Primeau would meet twice again. Farabee had two of BU’s best scoring chances in the second period. He had two breakaways as he went one-on-one with his World Junior teammate with Team USA this winter. Primeau won both battles to keep the game tied at one. Primeau made 26 saves in the game. It was a tough third period for BU defenseman Kasper Kotkansalo as he took two minor penalties in the frame. His first came at the 4:20 mark and his second came 10-plus minutes later. Northeastern (16-8-1 overall, 9-6-1 Hockey East) peppered Ottinger throughout the third period with 24 shots. The 2017 Dallas Stars first rounder stopped all 24 shots he faced in the period. BU had a chance to end it before the extra session as Northeastern’s Lerario went to the box for hitting-from-behind with 2:23 remaining. It was reviewed as potential major penalty, but the referees decided it was only worth two minutes. Northeastern was able to kill it off and the game went into overtime. BU was 0-for-4 on the power play while Northeastern was 0-of-2.